Gundam SEED, the graphic novel adaptation of the hit anime series, follows a nearly identical thread as the TV series, beginning with the shy and brilliant Kira Yamato, a peaceful resident of space colony Heliopolis. Though Heliopolis is a neutral party in the ongoing war between the Earth Alliance and the ZAFT military organization (staffed by genetically enhanced geniuses called "Coordinators"), the Earth Alliance has begun building secret mobile suit prototypes called "G Units" (or "Gundams") on the peaceful colony. Soon, ZAFT commander Rau Le Creuset (SEED's obligatory Char-clone) leads a team of five Coordinator pilots to assault Heliopolis and steal the new G Units. Athrun Zala, a ZAFT recruit working on the mission, comes face to face with his childhood friend Kira for a moment, but only before each of them is thrust into the G Units: Athrun to take it back to Creuset and Kira to stay protected from the weapons fire outside. In little time, Athrun and his comrades have taken their Gundams back, and Kira and his friends are stuck as runaways on the new Earth Alliance spaceship Archangel. Kira is pressed into battle as the only one who can pilot the sole remaining G Unit, beginning once again the classic boy-pilots-mecha scenario. There is a reason why the main fanbase for giant robots is in anime, not manga. There is also a reason why shojo and mecha are two genres that have rarely been mixed. The painful reasons for both of these facts are clearly illustrated in the Gundam SEED manga, a hit-and-miss attempt to extend the Gundam fanbase to those who prefer paper over pixels. SEED is Mitsuo Fukuda's re-envisioning of the original Mobile Suit Gundam, and its preliminary story is quite similar. Even as a return to an old story, SEED still has an interesting plotline. The conflict between Coordinators and Naturals is a deep and very modern concept, one that causes us to ask questions that many mecha do not try to pose: What if we lived in a society of natural people, threatened by radical geniuses? What if we had to trust our lives to one of them, because he was the only one who could save us? We begin with a very uninteresting everyday life story of Kira Yamato as he talks with his friends and blushes in front of girls. Luckily the attack on Heliopolis quickly destroys this relative peace, launching Kira into a mobile suit and his friends into danger. The frenetic feeling held up throughout the middle section of the novel should keep even the most cynical manga art critics interested as the Archangel and its crew try desperately to escape the embattled Heliopolis. By the end of the story, not only are a plethora of opportunities for more adventures left in front of you, but a mysterious blonde-haired girl who knows more about the Gundams than she lets on is now a refugee on the spaceship. The Gundam SEED anime is well-known for discarding the shonen (boy's comics) character designs of previous Gundam series in favor of a more shojo (girl's comics) approach. This should be immediately noticeable to readers of the manga as well, since it continues to utilize those radically different designs. However, from the little I have seen of the SEED anime, I can say that the manga version of the character designs is much more irritating than anything I saw in the anime. Characters' eyes are far too large and spaced out, and most of the time it seems that they are only capable of registering a single emotion: shock. A similar point can be made about the mouths, which are always in one of two positions: closed or wide open. By the end of the manga, the identical shape of everyone's mouths when they scream becomes a painful bore. Even so, many of the Gundams look far too similar to be distinguished from each other. The grayscale print format does nothing to help this, making it a chore to figure out which Gundam is on which side in a fight. It's a shame that some great battle scenes and mech designs could be ruined so quickly by the simple lack of color. Del Rey is usually very effective with their translation and extras, and SEED is no exception. There are honorifics explanations, detailed translations notes with descriptions of other ways words could have been translated, and even a history of both the Gundam franchise and the manga creators. To make Gundam fans drool even more, Del Rey also included character studies drawn by artist Masatsugu Iwase with full notes about how he draws each character and mech. Finally, an untranslated preview of Volume 2 is also included at the conclusion of the graphic novel. The Gundam SEED manga is a noble attempt to move the Gundam story to the printed page, but the black-and-white manga format does not favor giant robots. Mech designs and story remain dutifully intact from the anime, and it is these two elements that provide the mediocre redeeming quality in SEED. In truth, Gundam SEED was built for anime, and like many series past and present, the original format is almost always superior. 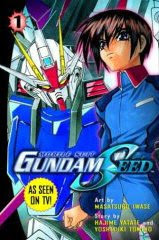 As an introduction to the Gundam universe, SEED is a thrilling and effective tale, but the television series, with its full-color art and more bearable character designs, provides a far more entertaining experience.